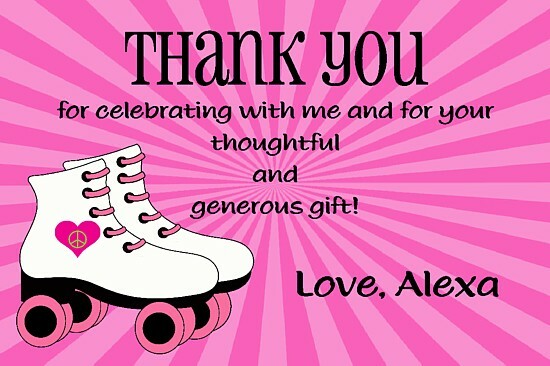 Roller Skating thank you cards can be personalized however you'd like. Say thank you to your guests by adding that custom touch. They are printed using a high quality laser printer and are very affordable! *Please Note: Thank you cards will be worded as shown in sample with the name that you request on them. If you would like them worded differently, you must let me know in the "Wording Changes" box. The name area can also be left blank if desired so that your child can sign their own name on them. First Name (last name optional) Be sure to include how you would like the card signed (Your Friend, From, Love, etc) Please type exact wording in this box.